I have to say I’m so very happy to learn from your teachings. I don’t believe any golf instructor previously has given me such a clear picture of how the swing and body work together to produce a good golf swing. I know I was hesitant to become a member of Ignition Golf, but now I’m totally impressed! You are the man! I had many questions about the golf swing as I was learning it years ago. No one could answer them. Fortunately, I saw Iron Byron and it gave me the clarity I needed. Plus, it’s simple. I feel that if you understand “why” you need to do something and how it fits in the big picture you will think it’s important and want to do it. I think there are a lot of people out there that need to understand exactly how it works. If I can help people understand it better then I am accomplishing my goal. Glad you decided to join us. Wonderful lesson ,Paul:since I follow your teaching it’s the one which is most ingrained in my mind (“TOUCH YOUR LEGS ,TOUCH YOUR HEAD” ).In the previous videos on the subject you didn’t insist that much on the angle at the end of the follow through (and why it is there ).I’ve got it now. 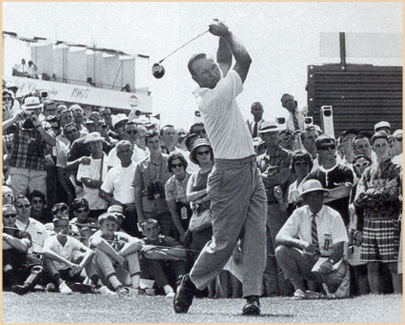 Now ,I seem to remember great Arnie (ARNOLD PALMER )had a more vertical follow through,the club would go up in the air and finish straight down his back . Is my memory correct and if so ,why did he finish differently from the other great pro’s? I also remember BOBBY JONES had a wonderful and graceful “sweet ” finish. Do you have pictures from him in his finish position ? BOBBY JONES was in my opinion the best stylist in the game. I say in the video that if you get the first 2 positions the 3rd one should take care of itself. If you get the first 2 you are going to look great. Great players don’t come out of it and not dwelling on it is less to think about. Two years ago I took a couple of lesson from an older pro. He kept using the expression, pro finish. Now I know what he meant. Thanks for reinforcing. Yes, this is the pro finish but it has to be very precise. This is why I want people to recognize the feedback of each position. Know you know it keep trying to go to it. If you look like a pro you will hit it like a pro. I notice your left arm does not to appear to be straight at the top of your back swing but very extended at impact and a foot or two passed impact.My question is does the left arm need to be straight as most other pro preach? I can’t straighten it not that I would want to. Extended but not locked. Other pros mus not have seen Jack Nicklaus, Freddy Couples and many others swing the club. It needs to be extended as you hit the ball to maximize the width of the arc. Great info Paul. Will put the practice in to try and create the finish position as a habit. Thanks. Very good. I really wanted to show proof so people will think it’s important (which it is). Glad you are going to work on it. Paul, You say to drive the swing with the legs which is working but I have lost a little distance in doing so. I also hit the fairway from the tee every time which is great. In an interview with Lee Westwood he saoid if he needed a little more off the tee he woulld push more with his right side to get the distance. Do you agree with this or not? My old kpoints have a little trouble gettng to the correct follow through but I am trying. Also Jack said the felt like he was throwing the club at the ball. Do you agree? PS nowif I can just get over the yips. I certainly agree with Lee Westwood. Have you not seen this tip? Yes, I totally agree with Jack too. Yips are from you trying to hit the ball. Think beyond the ball and they will go away instantly. Heavy rough – take you sand wedge and chop it back out into the fairway. I’ve been working on your swing for a few months now and I struggled with certain parts and I never new whether my arms were powerless or not. But this lesson should be the first mandatory lesson. I watched all three and went to the course and now I understand what I’m supposed to feel. Thank you my game is changed forever. That’s great. I love it when people have that light bulb moment. I had a few in my life. Once you get it, it is game changing. Hi Paul, I seem to be hung up on triggering arms starting down at top of backswing. It is more a mental block I can’t seem to over come. Any thoughts? The tip tonight is perfect for you so make sure you follow it and keep doing it until you let the arms relax. There is a mental aspect of it. You are trying to hit a good shot. Mentally you are equating x amount of shot with x amount of power. No arms and not trying to hit anything will be a totally different feeling. You have to realize this new feeling is correct. You also have to realize you are not good at it. So you tee up your ball. You put the easiest swing on your ball trying to do a full swing. Stick to this level hitting your ball 2/3 of your normal distance. Stick to this level until you are good at it. Once you can consistently hit shots at this level you speed up your lower body to get more power NOT your arms. Also, you need to be reducing the amount of balls you hit and continuously working on my swing positions building a great swing. This means you are doing lots of practice swings working on and checking the feedback for each position. This is a totally different way you are hitting the ball. You are using your body not your arms. So if you keep feeling what you normally feel when you hit the ball you are doing it wrong. I feel nothing in my arms and tremendous power in my legs. I am coiling and uncoil to hit the ball. To get more power with a feeling of nothing you are using physics to hit the ball which is mass (club) swinging around and axis (your body). Just like a weight on a string. How do you make the weight twirl faster? You turn your hand faster. How do you hit the ball longer? You turn your body faster. You do nothing with your arms and club. Understand this concept. Understand it will feel different. Understand you are not good at it. For every ball you hit into the future you are literally telling yourself not to hit it. You are using your body as the power source. So work on the lessons on the start here page. Do tons of practice swings. If you are hitting balls right now slow down and hit them 2/3 of their normal distance until you are good at it. Once you are good at it you drive the lower body harder for more power. You will know you have it when the club feels heavy and you have an unmistakable feeling you hit every shot with your legs and hips not your arms. i try to get to the follow through position, but every time the shot is horrible and i lose confidence in executing it. i think i then subonciously alter it to get better results. Suggestions? So stop hitting balls and work on the position every night in a mirror until it is perfect. I can’t believe you don’t already have this mastered. This positions tells you the mass (club) is moving at 90 degrees to your body, it tells you that your wrists are loose, club is re-hinging and arms are powerless so in no way would this make you hit bad shots. This is a HUGE position in your swing for power and consistency. So every night you take out a 7 iron and swing towards a mirror so you can see the positions and if the club is exactly parallel to your ears or not. You should also bee feeling it physically touching the back of your head so you can hit the exact same position every time when you are at the range and when you play because you need to be able to repeat it time and time again. Great tip Paul, particularly the bit about the angle. I had not fully appreciated the significance of the angle staying constant throughout the swing. The way you explained it there was perfect for me so I look forward to practicing it soon. Glad you liked it. Just keep this image in mind as you reach the follow through. If you copy what pros are doing you will have the right fundamentals. Great tip as usual. For the first two positions there is a feedback mechanism to know if you are doing the positions right or not. But for the third position to be on a angle is there any feedback mechanism. I know you told that if I do the first two, third one is automatically take care of. But for me sometimes it is not the case. So any tip for third position to ingrain into my system. There is feedback of the third position. It would be that you are watching your ball through tilted eyes not level eyes. You can get the tilt but not hitting with your arms. The harder you hit, the more you will look to see what you hit thus causing you to stand up. What a great daily ritual. I find my self standing up more straight at finish, so I will work on keeping a slight angle. I have a really nice indoor practice mat that I swing without balls as well. With this new practiced finish position I find myself sweeping the mat and not missing it like I usually do. Just be careful that you aren’t so fixated on where the ball would be otherwise you are still hitting. I usually like people to swing slightly off the ground so they aren’t thinking of hitting anything. Just be careful. Great stuff as usual. I’ve sent through a very short video of my left handed senior swing and hopefully you will have received it. I do my best to adhere to your follow through positions and my game noticeably improves when I have those few thoughts in my head. A question regarding the parallel to the ears finish is that I have a senior colleague who plays well and particularly hits his drives far and straight but has a more “old fashioned” swing with his finish straight down his back. Why is it so important,therefore, to finish parallel to the ears and would he improve if he finished this way? Your colleague is sliding laterally. This is how we were taught ma y years ago. In doing so the club goes up into the through swing and down the back. This is indicating he is swinging inside out at the ball. I would think he draws the ball. 2. You can check it on your own and copy exactly what better players are doing. There is only 1 parallel. 3. It tells you if you are re-hinging the club. 5. This position fixes impact. You cannot do this if you are wrong a impact. If he did my follow through this would get him hitting it more down the line as opposed to too much from the inside. If he hits pushes, push fades and duck hooks this would fix these shots. I would also give him more power with less effort because something turning moves faster than something moving laterally.